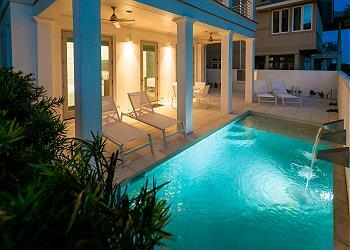 DETAILS: Welcome to 2 Spanish Town Court, a luxury Gulf front home and carriage house located in Rosemary Beach! This beautiful Rosemary Beach vacation rental is equipped with fabulous posh interiors and features amazing Gulf views from the second and third floors. The first floor is comprised of two guest bedrooms with ensuite baths, plus a bunk room. The second floor is the main floor of this luxury home. Guests will enjoy entertaining the entire family in the open living room, dining room and kitchen. Relax and take advantage of the panoramic Gulf views while lounging on the couch or sitting at the dining room table. The endless Gulf views are sure to leave you filling refreshed. The master suite is located on the third floor, equipped with a private living room and balcony. Enjoy the dazzling Gulf views from the balcony while sipping your morning coffee. 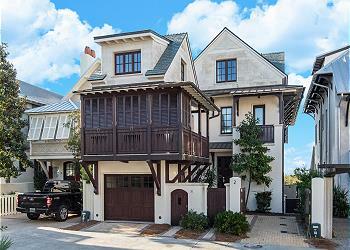 This Gulf front home is also equipped with a carriage house. The carriage house was designed as an independent guest suite, featuring a living area, galley kitchen, half bath downstairs and lofted bedroom with full bath upstairs. When you're ready to get out on the town hop on the 5 bikes provided to explore Rosemary Beach! 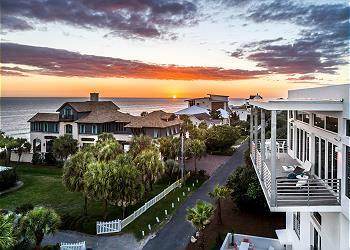 Enjoy the beautiful architecture of Rosemary Beach or ride over to the community pools! Check availability and book this lovely 360 Blue home today! *The fireplace is not functional and is for decorative purposes only.